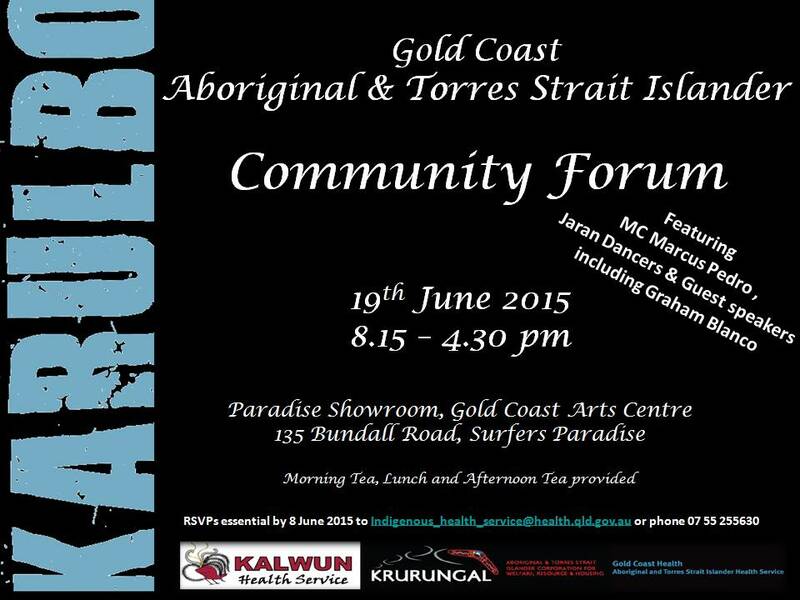 Exciting news – Karulbo will be holding it’s inaugural Youth and Community Forum in June 2015 which will include a two day Youth Forum on the 17-18 June, a one day Community Forum and a Community Dinner on the 19th June 2015 all to be held at the Gold Coast Arts Centre, Bundall Road, Surfers Paradise. – Supported by MC Hip Hop Artist and Move it Mobstyle host Brothablack (Shannon Williams) and guest speaker Elizabeth Wymarra (Black Comedy). – MC Marcus Pedro and the wonderful Jaran Dancers. 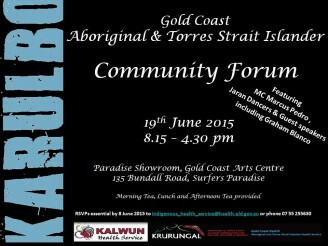 – provides an opportunity for Community members to celebrate of all the great work that happens within our community. – Brisbane Aboriginal and Torres Strait Islander Band ‘SLIP ON STEREO’. Registrations for all events close on the 8th June 2015. If you have any questions or would like to register please email Indigenous_health_service@health.qld.gov.au or phone 07 5525 5630.